IF YOU have planned a visit to Smokehouse Deli soon, you could either be content just sampling their new menu or throw caution to the wind and delve into their curated swine dine fest coming up this week. a�?Imagine tucking into tender, slow-cooked pork with deep, golden brown skin, striped with rivulets of caramelised fat that crackle at each bite. Or even rustic pork dishes with simple shared flavours created using a combination of smoking and long cooks,a�? explains Fernandes. So look out for his newest signature dishesa��crisp pork with pomelo, pomegranate and herbs, sorpotel served with jasmine rice as well as some distinct influences from his recent trip to Spaina��spicy chorizo with maple vinegar and soy. And if you still have cravings lefta�� therea��s a dollop of pork in the dessert tooa�� chocolate cake with bacon ice cream, no less. The meal is meant to be a leisurely affair, spanning several courses and washed down with unlimited beer or sangria. a�?Somewhere down the line, you can also expect to be served a slice of delectably crispy smoked belly, or hear the distinct crackle of crisp fried chicharrones (pork rinds). Apart from the one-off swine dine experience, their new menu covers every section from breakfast bagels that can be had with cream cheese and herbs, wasabi and smoked salmon or even tenderloin and mustard. The salads are excellent from the crunchy pear and mango chilli to the chicken version with bits of crunchy flax seeds. Hearty finger foods like grilled prawn skewers, olive and veggie nuggets and mains like polenta lightly smothered in intense mushroom sauce or chicken roulade with porcini mushrooms keep you well nourished while you sample their signature fruity cocktails before winding up with a serving of dessert. In this case, a deliciously light apple tart. Swine Dine on January 29. 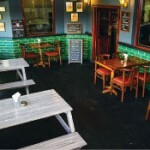 The Local looks like it belongs on a street corner in London. Set atop a building in Kalyan Nagar, you cannot miss the audible old-school rock music that sets the mood for the evening as you make your way up. An alfresco space with wooden benches, complements the well-stocked indoor bar with its leather-upholstered booths set along the walls. The menu is smartly divided into bar classics, short eats and salads and we got off to a great start with chicken chaat, nachos and cheese. Not for the faint-hearted, the chicken is basically like a bhel puri loaded with diced chicken and a spicy, tangy mixture instead of puffed rice, that works great with a chilled beer. The nachos and cheese were a trifle underwhelming. The bar menu has a vast line up of classic, innovative and Local specials. Chololatini laden with chocolate, Baileys, Kahlua and vanilla ice cream was an instant hit like the house special, the Bloody Maria a�� a Bloody Mary but with Tequila. The mojitos, Long Island iced teas and sangrias kept to the book too. If you are just feeling snackish, the a�?slightly hungrya�� section has cutlets, wraps, rolls and salads. Or go a�?Locala��, with dosas, appams and idli with curry. Those with a larger appetite could dive into the a�?really hungrya�� section as we did. 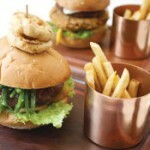 The burgers (beef and chicken) are perfectly sized and come with potato wedges on the side, fried to perfection. We also tried the chicken fajita, complete with sour cream and salsa, but it was the grilled fish that stole the show. Lightly marinated with herbs, it is a simple satisfying meal served on a bed of delicious (and unusual) couscous. Perfect to balance the sinful starters! Head here for a casual vibe where customers and staff share an easy camaraderie and burst into song unexpectedly on occasion.